Faces of Fourth is a featured series on the folks that are the heart and soul of Historic Fourth Avenue. From the merchants who bring commerce to life, to the buskers who fill the avenue with sound, there are many people to celebrate on Fourth Avenue. One man’s trash is another man’s treasure…. Especially to the owners of Pop Cycle on Fourth Avenue. One of the owners, DeeDee Koenen has a line called DDco Design in a studio in the back of the shop, which is dedicated to the concept of breathing new life into discarded objects that were once destined for the trash heap. They strive to keep reusable and recyclable building materials out of overburdened landfills, by de-constructing materials and channeling them back into the marketplace, creating fun and functional items for the home. Beyond their personal designs, Pop Cycle is also filled wall to wall with whimsical art work and curiosities from local artists. Pop Cycle has become a signature spot on the Avenue and has a loyal fan base of folks who love unique jewelry, art, and home goods. 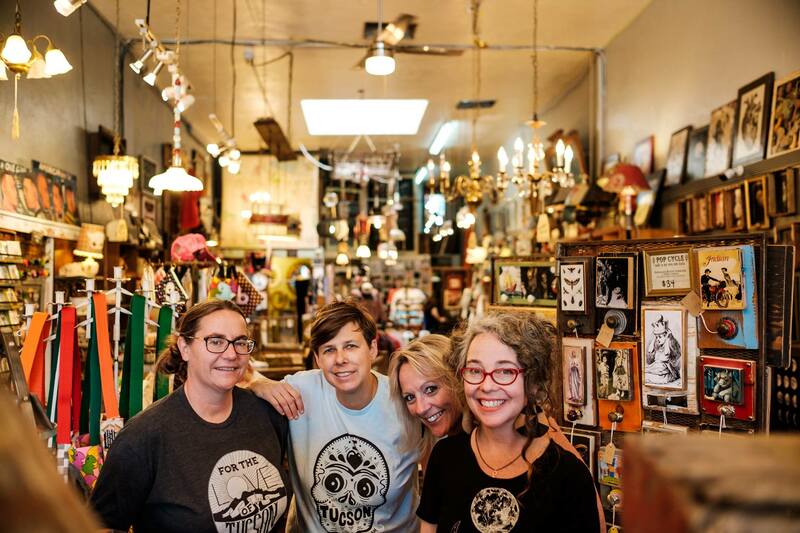 DeeDee has a long-standing relationship with Fourth Avenue and is passionate about keeping Tucson local and unique. Koenen spent her early childhood on a ranch in Vail, Colorado and moved to town when she was in her early teens. She attended school at Rincon High and graduated with a degree in Fine Art from the University of Arizona. After attending graduate school for photography in Santa Barbara, she returned to Tucson to start her own business. “I missed Tucson, so as they always say ‘you’ll be back’ and I was, gladly.” Koenen shared. We chatted with DeeDee to find out what makes Fourth Avenue a special place for her. Dee Dee (far left) and the Pop Cycle staff in the shop. When did the Avenue first start playing a major role in your life? My parents have owned our building since the 70’s. They had an antique store in the current Pop Cycle, and Surly Wench called “Lost and Found.” I remember spending many days on Fourth playing in the store. In the 90’s my mom opened a club call “The Fourth Avenue Social Club,” where my whole family worked. When I moved back from Santa Barbara it was difficult to find a good job, so I started DDco Design. When we were looking for a larger space for DDco, the hair salon moved out of our building. My sister and partner suggested we open a shop and in 2008 we did. One of the best things I’ve ever done. What’s one of your favorite things about the Avenue? My favorite thing about the Avenue is it’s mostly local and the sense of community can not be beat. Also the fact that Fourth Avenue has a long history of embracing diversity and standing up for what is right. Where is one of your favorite places to frequent on Fourth? Well that is too hard to pick! There are so many great spots. No matter what you are looking for, you can find in down on Fourth. You can literally spend an entire day here and fill it with things to do. Tell us one of your most memorable experiences on the Avenue. One fond memory I have is attending Latin Night at the “Fourth Avenue Social Club” on Thurdays at what is currently, the Surly Wench. People would get completely decked out and dance all night. The whole floor of the club would shake from everyone dancing. If you could time travel, what year would you like to visit Fourth Avenue? I would love to see the whole Avenue during the Roaring 20’s. I would like to see our building being erected. 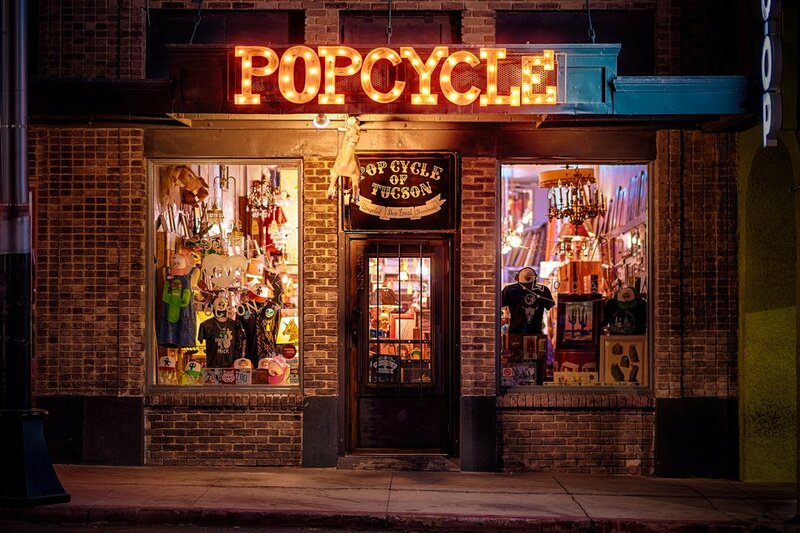 The exterior of Pop Cycle at night. Photo courtesy of Pop Cycle.